Posted in Status on February 19, 2019 by erik.rasmussen@noaa.gov. The VORTEX-SE field program, “Meso18-19” is conducting its fourth Intensive Observing Period across the Southeast. This began at 6 AM today and will continue into Wednesday night. Soundings are being launched from 13 NWS sites, and 10 sites operated by universities and NOAA labs, every six hours. Additional more detailed observations will kick in across northern AL if the system moves that far north. There is a warm front just offshore in the Gulf of Mexico. The suite of forecast models have varying solutions regarding how far inland this warm front will move tonight and tomorrow. The air to the south of the front has enough CAPE to support storms with low-level updrafts suitable for some tornado potential. To the north, the air is very cool and, based on our present understanding, tornadoes are nearly impossible. The low-level shear to the north of the warm front is immense because of the temperature contrast between the two airmasses. Of more concern, though, will be the shape and length of the low-level hodograph in the warmer, humid air once the front moves inland. These sorts of situations, with great uncertainty about the return of warm humid air off of the Gulf of Mexico, are not uncommon in the Southeast. In our previous years’ field campaigns, this uncertainty made it difficult for the scientists to anticipate the likelihood of storms, and their tornado potential. VORTEX-SE includes research into how we can most effectively communicate about multiple ongoing hazards… a common situation in the Southeast. This event is no exception, with heavy rainfall and possible associated flash flooding a real threat across portions of the region. This event also illustrates one of the difficulties of threat perception: it is February, and temperatures across the region are predominantly in the 40s with cold rain. This doesn’t feel like tornado weather, and if the tornado threat does develop tonight or tomorrow, it may only “feel like” tornadoes for a short time before they occur. We may wrap up our observations for this case a bit earlier than we normally would in order to give all of the participants time to rest and plan for another IOP on Friday and Saturday. 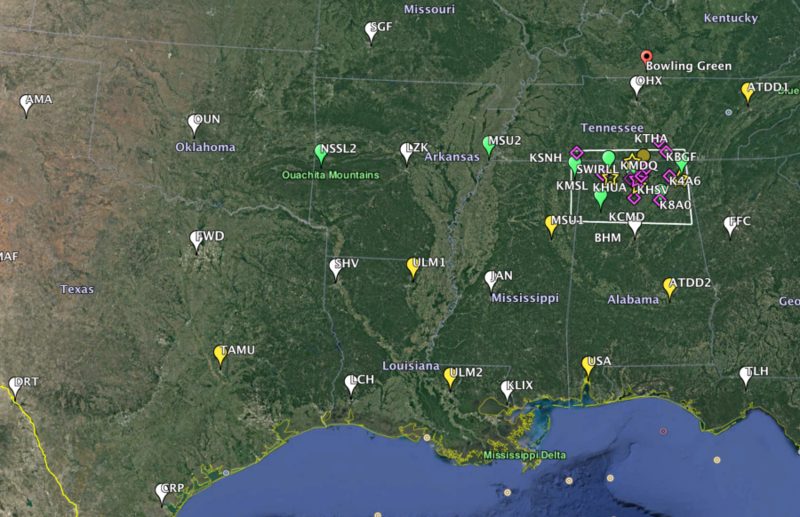 Current models are showing a potent setup, with tornado potential across AR, northern MS, TN, and northern AL. Of course, this forecast will change (this blog is NOT an official forecast!). But in Meso18-19, we must decide on IOPs at least 48 hours in advance to give all the participants adequate time to prepare, and so for a Friday morning start… today was decision day. Stay tuned.